Una pintura muy bonita y alegre, besos. Jane this has me wishing for a garden of lovely flowers. Beautiful painting my friend. The texture really comes out in this one and adds interest throughout the painting! You have made good use of the space dividing it into sections. Very appealing, Jane! I love this picture and the flowers on it. Greetings. Hola Jane. Este conjunto floral es un encanto, lleno de color y alegría. Abrazos!!! Dag Jane, dit is echt een fantastisch werk, doet ons reeds dromen van de komende zomer !! Another lovely bouquet of flowers Jane - the colours are charming. Such a beautiful bouquet! It brightens up my day! Quelle beauté tellement intime et sereine, moderne et classique à la fois! 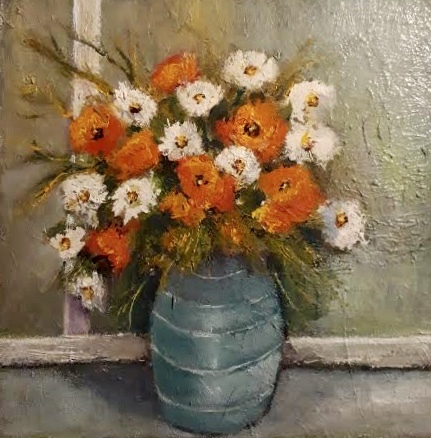 One of my favorites - the texture of paint adds a wonderful quality to this lovely bouquet. Color and texture reach right out and touch my soul. Beautiful. This painting has taken my breath away! It is simply beautiful! Very vibrant, they are sure to make anyone's day extra special! Me confieso enamorada de tus flores. Precioso!! I love this painting - the flowers, the design, the texture - beautiful!